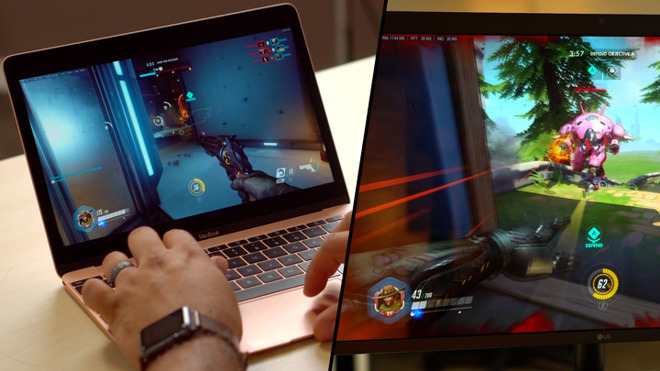 Nvidia's service, currently available for testing in the U.S. and Canada, relies on the power of GeForce GTX GPUs in the cloud to deliver a virtual PC experience to Mac owners. The clever system performs all the heavy lifting in the cloud, then pipes down a processed stream to a user's Mac, allowing owners of older Apple hardware play games that they might not otherwise have access to. In addition, since the service is basically a virtual PC, users can sample a host of PC-only titles. The virtual PC experience is integrated with online game stores like Steam, Origin and Battle.net, where users can sign in and purchase titles just as they would on a Windows rig. Previously purchased titles can also be installed on through the GeForce Now interface, meaning users don't have to pay twice to access a game they already own. AppleInsider tested out an early beta of GeForce Now in June and found the service to be more than adequate for all but the most demanding games. Frame rates were solid, gameplay smooth and video was, for the most part, free of artifacts. As Nvidia notes, a fast internet connection is recommended for optimal results. In our time with the service, we found Wi-Fi to be acceptable even for fast-paced games like Overwatch, though a hardwired connection provides the best experience. Nvidia GeForce Now is available for free during the beta testing phase, which runs through the end of the year. Games, of course, must be purchased separately. Nvidia is touting "Playerunknown's Battlegrounds" as a marquee title on its dedicated GeForce Now webpage, but a number of other games are compatible with the service. For example, the recently released "Divinity: Original Sin 2" is available for play, as are older classics "Dota 2" and "Team Fortress 2." Once the service goes live, GeForce Now will move to a tier based subscription system. Pricing has yet to be determined, but Nvidia estimated game packages to start at $25 for 20 hours of play when it debuted the service earlier this year.